Nearly 30 years ago, on the day before he was to play for a national championship, Andrew Gaze was on the defensive. A native of Australia, Gaze was 23 years old. He had already played in two Olympics, and he had already been a dominant force in Australia’s semi-pro league. He enrolled at Seton Hall the previous fall with the intention of staying for one year—and one year only, though the school did make an effort to try to get him a second year of eligibility. This being the era when college players at big-time programs were expected to stay in school for three or four years, press accounts of Gaze frequently referred to him as a “mercenary” or a “ringer” or a “hired gun.” And so, on the day before Seton Hall’s Pirates were to face the Michigan Wolverines in the 1989 title game at Seattle’s Kingdome—seven months before the NCAA signed its first $1 billion agreement for broadcast rights to its men’s basketball tournament—Gaze sat through a pre-game press conference filled with questions about his intentions as a student-athlete. It would be stupid to say Gaze was not there for the basketball, even to this day. But it nonetheless caused something of a furor after Seton Hall lost that title game by one point because of a controversial foul call in the waning seconds, and then four days later Gaze got on a plane and flew back to Melbourne for good. Gaze didn’t go straight to the NBA, and a few others before him had jumped to the old ABA after only one year. But this is the story of college basketball’s first true one-and-done. Gaze literally grew up in a gym. His father, Lindsay Gaze, had a lengthy career as an international player and coach, and is now in the Naismith Hall of Fame. Lindsay Gaze was also the longtime general manager of the Victorian Basketball Association, an AAU-like development program. When Andrew was growing up, the family’s home was in the official GM’s residence, which was attached to a nine-court facility used by the Melbourne Tigers, the club team Andrew played for (and Lindsay coached) both before and after his stint at Seton Hall. Gaze went on to become the greatest basketball player in Australia’s history. A sharpshooting 6-foot-7 small forward, he was also a gifted passer and defender. “Andrew was just far superior to most kids his age in terms of not only shooting, but experience and also basketball IQ,” John Carroll, a Pirates assistant coach at the time, told me. Gaze is a five-time Olympian, a FIBA Hall of Famer, a 15-time National Basketball League first-teamer, a seven-time NBL MVP, and a two-time NBL champion. He even played parts of two seasons in the NBA, winning a ring as a deep reserve for the 1999 San Antonio Spurs, for whom he averaged three minutes over 19 games. These days, Gaze is the head coach of the NBL’s Sydney Kings. P.J. Carlesimo was aware of Gaze by the time the Australian National Team came to the U.S. in 1986 to play a handful of exhibition games against Big East schools. And before Gaze had finished tearing through several of the league’s teams with 40-point performances—including 46 points against Seton Hall, the team Carlesimo coached—Gaze had Carlesimo’s full attention. There was even a time when students at other Big East schools would contribute to the Pirates’ booster club so as to snap up Seton Hall’s unused allotment of Big East tournament tickets. By 1985-86, the Big East was enough of a draw for Seton Hall to move its conference home games to the Meadowlands Arena in East Rutherford, right next to Giants Stadium. It was Carlesimo’s fourth season. His first winning campaign wouldn’t come until a year later. But soon after Gaze wowed them during that ’86 tour, Carlesimo, Carroll, and athletic director Larry Keating had Gaze on their radar. “He was one guy that I kind of earmarked that might come to the States,” Carroll remembered. The following summer, it was Carlesimo’s turn to coach a team of Big East All-Stars on a tour of Australia. And because Big East commissioner Dave Gavitt had a scheduling conflict, Keating went too. The Pirates made their pitch, but Gaze was dead set on playing for Australia in the 1988 Olympics, and he wanted to spend the year preparing with his teammates. But Carroll, who would later coach the Boston Celtics on an interim basis, never gave up. He spent the next year calling Gaze regularly—not the easiest task in those days, considering the cost and the 14-hour time difference. “John Carroll was just super persistent,” Gaze recalled. Gaze had already completed two years at the Footscray Institute, which is now Victoria University. But he missed a lot of schooling in the run-up to the Olympics, and he and his parents saw what Seton Hall was offering as a chance to get in two semesters of course work while also competing at American college basketball’s highest level. Gaze just wouldn’t be able to enroll until after the Olympics. Which, for Gaze, didn’t end until a loss to the U.S. in the bronze-medal game on Sept. 29, several weeks after the fall semester began. Gaze was listed as a junior upon his arrival at Seton Hall that October. He joined a senior-laden Pirates team that had earned the school’s first NCAA bid the year before. The NCAA that year allowed athletes who competed in the Seoul Olympics to skip the fall semester but to continue to play their chosen sport. Gaze and Pirates big man Ramon Ramos, who played on Puerto Rico’s Olympic team, decided to enroll in their fall classes anyway, even though they were several weeks behind. Gaze seemed to fit right in with his veteran teammates, but in the beginning, his naturally laid-back nature caused him to be a bit gun-shy. The Pirates got off to a fast start, opening the season at the Great Alaska Shootout with wins against Utah, Kentucky, and defending national champion Kansas—Roy Williams’s first loss as a head coach. The Hall ripped through its non-conference schedule with a 12-0 record and had risen to No. 10 in the polls when it defeated No. 5 Georgetown in the school’s first-ever sellout at the Meadowlands. As the season wore on, Gaze’s scoring prowess would reveal itself—but only sometimes. The Pirates had four double-figure scorers, led by guard John Morton, who would be a first-round pick that summer for the Cleveland Cavaliers. 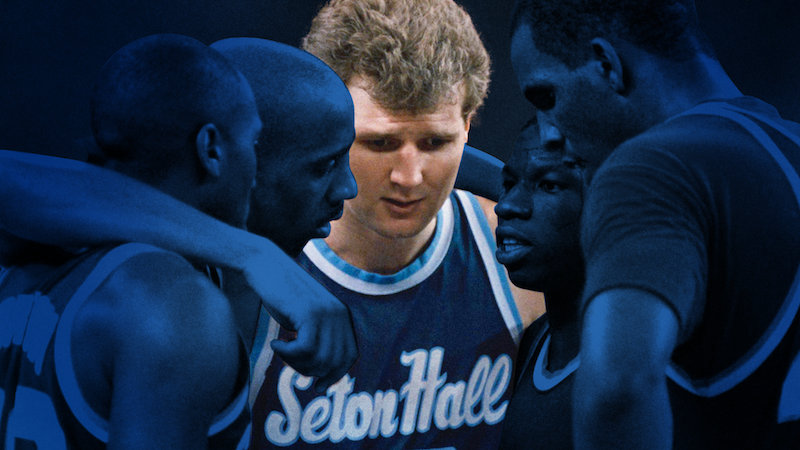 They also played ferocious interior defense, a prerequisite for survival in the bare-knuckle Big East of the 1980s. All that balance meant that one night, Gaze might score 17 points in the first 10 minutes. Another night, he might barely score at all. The Pirates would remain in the Top 15 the rest of the way. Though picked to finish seventh in the Big East by the league’s coaches, they ended the regular season in second place. Three of their six losses entering the NCAA tournament had come against Syracuse. Seton Hall went into the tournament as a No. 3 seed in the West Region. After grinding out wins against Southwest Missouri State and Evansville, the Pirates took out No. 2 seed Indiana in the Sweet 16 by limiting the Hoosiers to three field goals in the final 15 minutes. They got No. 4 seed UNLV in the regional final after the Runnin’ Rebels knocked off top-seeded Arizona. Gaze had 19 points, five rebounds, three steals, and two blocks against UNLV. Defensively, Gaze was charged with sticking Stacey Augmon, one of UNLV’s all-time greats; he limited him to 4-for-12 shooting. The Pirates pulled away in the second half for a remarkably easy win. Gaze was named West Regional MVP. All the while, Gaze was becoming a sensation, both in the U.S. and back home in Australia. News reports were heavy with clichés likening Gaze to Crocodile Dundee, while at least one television report ran B-roll overdubbed with the ’80s Australian band Men at Work. In the national semifinals against Duke, Seton Hall fell behind 26-8, only to roar back after a Duke freshman named Christian Laettner got into foul trouble, and another starter, Robert Brickey, badly bruised his thigh. The Pirates were too quick for the Blue Devils, and Gaze scored 16 of his team-high 20 points in the second half. Seton Hall won, 94-78, setting up a date with Michigan in the title game. That game is best remembered for the ticky-tack foul referee John Clougherty called on Seton Hall point guard Gerald Greene (No. 15 in white) with three seconds remaining in overtime. Freshman Rumeal Robinson—who made just 64 percent of his foul shots during the regular season—famously drained two free throws to give the Wolverines an 80-79 win. Gaze told me he was disappointed by the call, but that he never really took the time to reflect on it or to even watch it again until Seton Hall sent him a 20th anniversary DVD a few years back. Gaze told me that when he was back in the U.S. a few years later for another exhibition tour with the Australian team, he played a game that was officiated by Clougherty, and that Clougherty approached him and told him he had made a mistake by calling that foul on Greene. Two years ago, just before he retired as the ACC’s supervisor of officials, Clougherty made a similar admission to the Raleigh News-Observer. The morning the story dropped, John Carroll took a train to Philadelphia for a second interview for the vacant head coaching position at Penn. “I was, like, well, I guess I’m not getting this job,” Carroll told me, though he did wind up getting hired at Duquesne a short time later. The details about the trust fund remain murky; there was never any corroborating evidence of what the fund was used for, or even whether any of the money was used at all. But as was true of all potential NCAA scandals at that time, most of the coverage was refracted through the prism of the sanctity of the NCAA rule book: The Times quoted Gaze as saying the money was “more like expenses,” with Lindsay Gaze saying neither he nor Andrew touched any of the money, while Keating, Seton Hall’s AD, later told Newsday that Lindsay Gaze had assured him the fund was for expenses used to run the club team. Even today, in our recent conversations, Gaze, Carlesimo, Keating, and Carroll all assured me that no rules had been broken, and that Gaze was a model student. In the end, nothing happened, no punishments were handed down, and the story faded into the ether. The subject still gets Carroll all kinds of fired up. There’s a direct parallel to be drawn between Gaze’s situation and the current discussion about one-and-dones in college basketball. Gaze wasn’t aiming for the NBA draft in 1989, but he did get to define his own experience as a college athlete—an avenue the NCAA typically only keeps open for everyone but the athletes themselves. The same athletes the NCAA refuses to compensate because of its attachment to a false premise of amateurism. Gaze insisted to me that he earned credits during his brief time at Seton Hall, and that he never would have enrolled had it not been for those credits. A spokesman for Victoria University confirmed to me that Gaze did eventually earn his degree, in 1996, some seven years after he blew out of South Orange. But that was never the point. What was the point was that Gaze got to parlay the experience he had playing against top-flight U.S. college competition into an incredibly successful career as a professional basketball player back in Australia. And there was never anything wrong with that. Carlesimo then maneuvered into a lengthy discussion of Seton Hall’s commitment to academics, noting that center Ramon Ramos was the Big East’s academic player of the year. Carlesimo said players attend study hall two hours a day, four days a week, and a tutor has accompanied them during the tournament. Given their location in the hub of the Big East conference, the Pirates are able to travel to and from games at night, thus rarely missing class time during the regular season, according to Carlesimo. That Gaze was an international player—the Boston Globe in 1990 estimated that there were “approximately 135 foreigners from 36 nations playing NCAA basketball” back then—made the situation that much more difficult to define and regulate. How would anyone categorize the education he got in Australia? How might the courses he’d take in the U.S. match up? Should he have to take a standardized test? This is the kind of dissonance the NCAA requires to prop up its system. The same system that once sought to shame Andrew Gaze for asserting his agency as far as he was allowed. Twenty-eight years on, Andrew Gaze has developed a more clear-eyed view of the NCAA. Jack Purchase, the son of his best friend, just finished his sophomore season at the University of Hawaii. Purchase’s experience in having to live according to the NCAA’s byzantine regulations has been instructive for Gaze. College basketball’s first true one-and-done understands the reality. He doesn’t need to be defensive anymore.